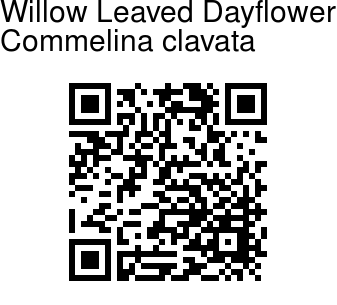 Willow Leaved Dayflower is a perennial herb with thick, non tuberous roots. Shoots are rising to climbing, rooting on contact with ground, up to 1 m long. Leaves are narrowly lance-shaped to narrowly lanceshaped-elliptic, 2.5-10 cm long, 0.4-1.5 cm wide, with pointed or long pointed tip. Flowers are borne in 2-flowered clusters. 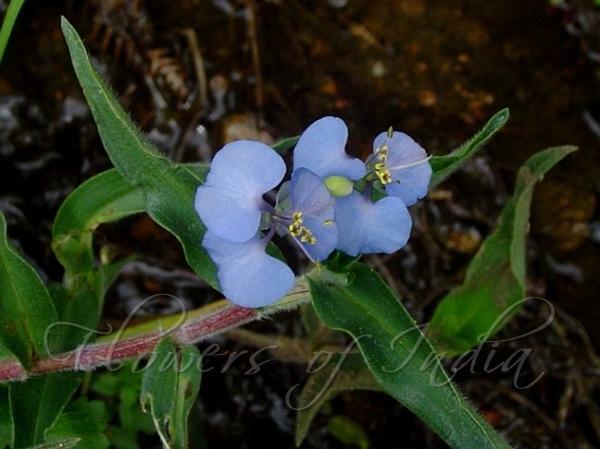 Flowers are sky-blue, about 1.5 cm across, with sepals 3 mm long. Paired petals are 7 mm wide, sky-blue. The third petal is 5 mm wide.